This mirror is exactly what I was looking for. I have it hanging above a counter in one of our clubhouses and it looks great. The frame helps to make it look very elegant and I would definitely recommend it. Incorporate modern style into your home with this silvertone framed mirror. Lean the mirror up against a wall or hang it directly on the wall to brighten the bedroom, bathroom, or living room. Dimensions 0.75 In. X 32.0 In. X 71.0 In. Mirror arrived well-packaged and as pictured. Simple and clean lines with the silver finish will fit many decors. Looks great in my mid-century modern master bedroom. Although it is described as a leaning floor mirror, there are brackets for hanging. If you are planning to hang the mirror (which we elected to do) you will need some very exact screw points or heavy-duty wire. This is a very heavy and seemingly well-constructed mirror! For the price, this is a good buy! This is a very quality mirror and I am glad I went with one this large. It goes well with contemporary décor and I just leaned it against the wall. It makes a statement and looks terrific in the room. Speedy delivery-mirror is perfect! Great size, excellent construction, solid enough to just lean against wall. Saved over $230 on the West Elm mirror I had planned to order! This is a great mirror, bought it for my daughter's college apartment as they ALL have big mirrors in their rooms. It is a great size the chrome finish looks beautiful. I am interior designer and I ordered this for the bathroom in my client's home. It came packaged very well and arrived in good condition. I would order it again. 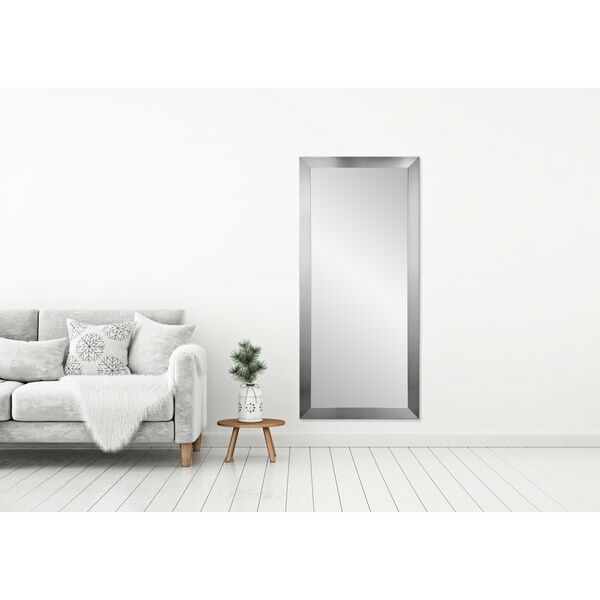 Love the mirror, it looks great and more expensive than the price and I have gotten many compliments on it. Good large mirror for the price! "The item name on the above shows "32 x 71", however, the dimensions in the specs shows "76.0 In. X 37.0 In". Which dimensions are correct?" Dimensions are 32 inches x 71 inches. The shipping dimensions are 37 inches x 76 inches. "How much did it weigh?" This is about 40 pounds. "Can this be hung horizontally?" This item can be featured in a vertical or horizontal displayed.